Created by Dr. Doug Bibus, leading lipid scientist and expert on omega-3s, this simple test provides a panel of results used to assess and monitor health, balance essential fatty acids, and improve nutrition. There are two families of EFAs: omega-3 and omega-6; each are a requirement of good health, and each have different biological effects. To keep these biological effects in balance and maintain health, omega-3 and omega-6 EFAs need to be consumed in a balanced ratio. The problem is that the modern Australian diet has dramatically upset this crucial balance—we consume too much omega-6 from refined vegetable oils, processed foods, and meat, and too little omega-3. Generally speaking, too much omega-6 promotes inflammation which can lead to disease, while omega-3s support healthy inflammatory levels, normal circulation, and immunity. The Holman Omega-3 test focuses not only on the amount of omega-3 in the bloodstream (Omega-3 Index), but also the individual levels of omega-6 vs. omega-3 in the blood tissue. (Tissue HUFA). The first is known as the Omega-3 HUFA test – the term HUFA being an abbreviation of ‘highly unsaturated fatty acids’. These fatty acids generally form the basis for our inflammatory response system. Armed with the knowledge that the inflammatory response produced from omega-6 fatty acids is remarkably powerful (and leads to disease), and that the same response from omega-3 HUFA is less potent in terms of its anti-inflammatory effect, Dr. Lands has established that a lower Omega-6 HUFA score with a higher Omega-3 HUFA score is the ideal condition. (Because omega-3 and omega-6 compete for space in our cells, an omega-6 score of 40% would mean an omega-3 score of 60% – an omega-3 score of 50% or higher is considered ideal). 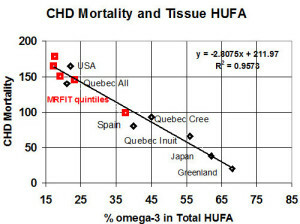 Dr. Lands has modeled several populations, their Omega-3 HUFA score and their mortality rate from cardiovascular disease, which is displayed in graphic form on each personalised Omega-3 report. Typical population with a Western diet have an Omega-3 HUFA score of 20%, which directly correlates to a high incidence of mortality from heart disease. Increasing this score to 50% results in an approximate 50% reduction in mortality, while further increasing the Omega-3 HUFA score to 70% nearly eliminates premature mortality altogether. The second indicator of heart health as it relates to blood-based omega-3 fatty acids is the Omega-3 Index. The Omega-3 Index is the combined value of two omega-3 fatty acids (EPA and DHA) thought responsible for the main physiological effects of omega-3 in a diet. Your total omega-3 score is generated from the measured amount of omega 3 in your bloodstream, described as a percentage figure. For example, if your omega-3 score is 5%, it means that 5% of the total fatty acids in your blood are made up of omega-3 fatty acids (a group of fatty acids which includes EPA, DPA, DHA and more). In certain populations such as the Japanese, who consume large amounts of marine based foods, the total omega-3 score is typically over 15%. The science behind the Omega-3 Index resulted from the work of Siscovick and Albert, who examined omega-3 levels in populations and then assessed their risk of sudden death. 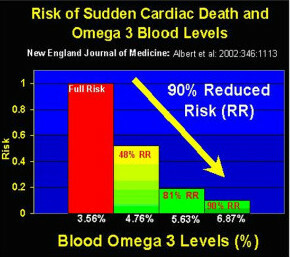 According to Albert’s data, increasing omega-3 blood values from 3.58% to 6.76% was correlated with a 90% reduction in risk of sudden cardiac death. Data from Siscovick’s work reported similar outcomes, further confirming the benefits of elevated blood levels of omega-3. An American and German scientist later coined the Omega-3 Index in 2004 as a blood-based risk factor framework for projecting Cardiovascular Disease risks. Another study from the Harvard School of Public Health and University of Washington examined data across 16 years on 2,700 participants aged 65 or older using used blood biomarkers to measure omega-3 levels, and found people with the highest blood levels of omega- 3s lived an average of 2.2 years longer than their counterparts with lower levels. The recommended Omega-3 Index is 8% or greater, meaning a combined percentage total of EPA and DHA greater than 8%.